Please try entering https://graph.facebook.com/429152857201150/photos?fields=source,link,name,images,album&limit=1000 into your URL bar and seeing if the page loads. After two weeks of gray skies in Hong Kong and Chengdu, Alissa and I have ventured further north into China to get some fresh air and see what China used to be like before its days of speedy construction and growth. We first spent two days at Jiuzhaigou National Park, which was interesting and beautiful, however it still felt like new China, not the old. 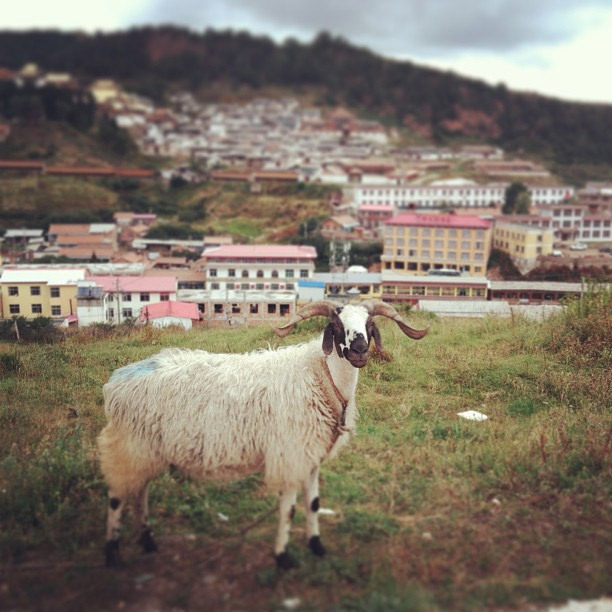 We caught the morning bus from Jiuzhaigou to a small Tibetan village six hours north called Langmusi. 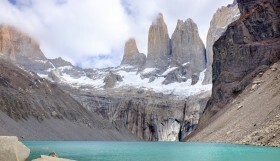 This town, and the surrounding area’s elevation is 11,000 feet, about twice that of Denver! We were a little worried about altitude sickness, especially since neither of us have ever been at this elevation before. However, after spending our first day here relaxing and getting to know the town, we have had no issues with the altitude. However, we have had some problems with the temperature. 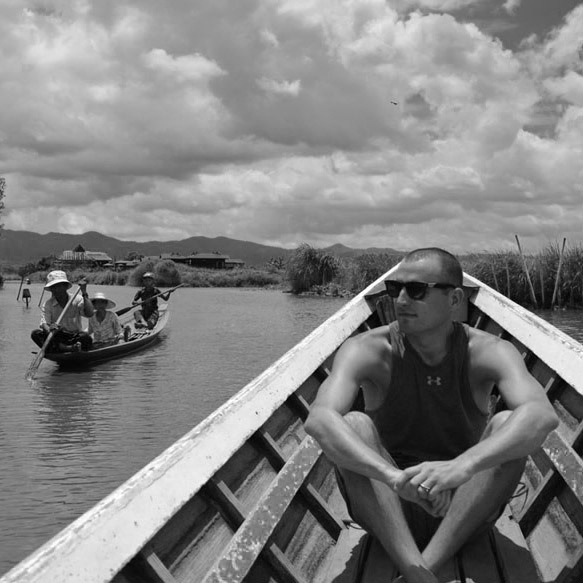 We’ve spent six months in SouthEast Asia, and we have never had a day with a temperature below 70°F/21°C. To be thrown into a town with temperatures around 40°F/4°C is quite a shock, and we do not have the proper warm clothes in our small carry-on bags to handle this. We are planning on renting traditional Tibetan clothes for our horse trek, but during the other days we have resorted to being as Minnesotan as possible and just sucking it up. When we’re outside we just walk pretty fast from place to place. Langmusi is the smallest town we’ve visited while in China, and yet we found one the best English-speaking Chinese person of our entire trip in here. Her name is Liyi, and she and her husband own both the best horse-trekking outfit in town, as well as the best cafe in town. (they even have Yak Pizza on the menu!) 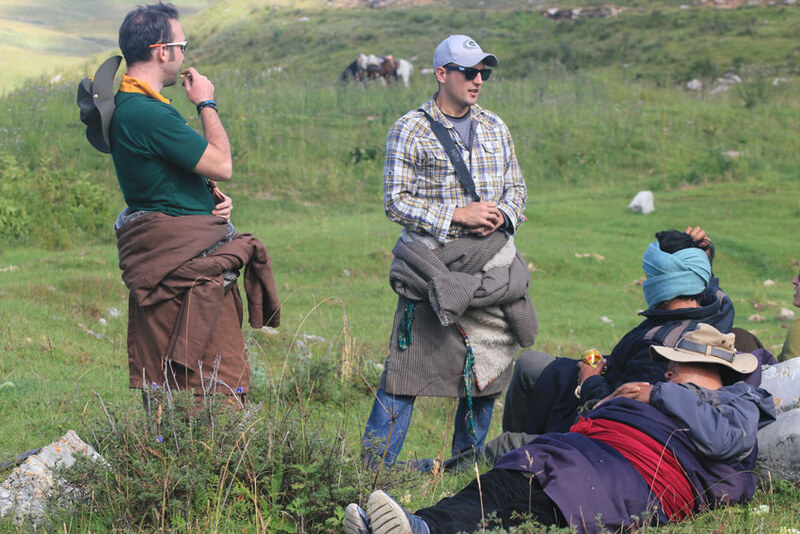 Liyi has set us up with a local guide who will take us on horseback tomorrow through the nearby mountainside all the way to his nomadic tent to spend the night with him and his wife before trekking back to town the next morning. 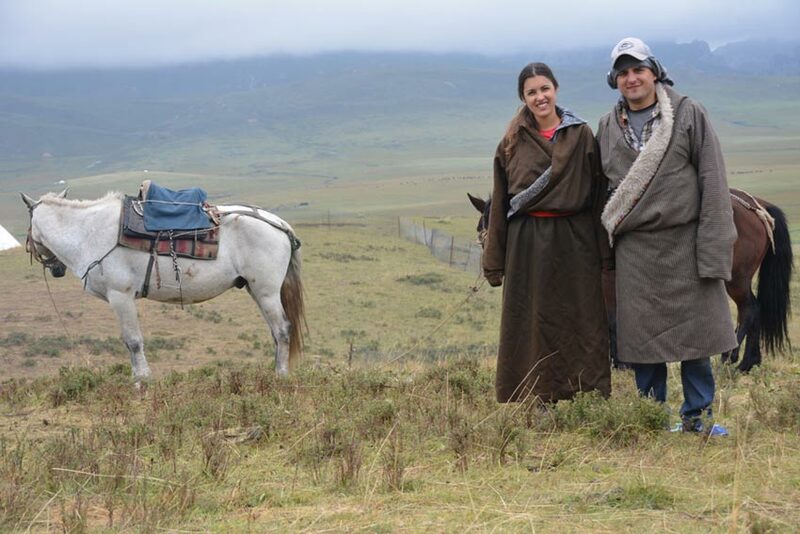 We’ve even been able to rent traditional Tibetan clothes to ensure we will be warm enough for the trip. It gets pretty cold at night and whenever the sun isn’t shining. Something interesting about the village of Langmusi is that it will not be a village for long. The entire city is under construction, including the construction of 40-50 brand new buildings. There are two or three streets being created with an entire row of new buildings alongside. It’s like nothing I’ve ever seen before. This village will be 4-5 times bigger by the end of next year. We are joined by another young couple for the first part of our trek today: David from Zimbabwe and Katrin from Estonia. After receiving a 30-minute horse riding tutorial (I’ve never been on a horse before, BTW), we head out of town, walking our horses alongside the road. 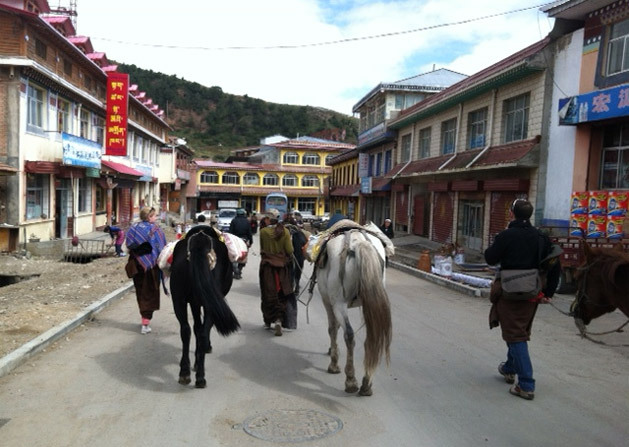 There are a lot of monks from the nearby monasteries who are in town today to shop, and each one of them stops to stare and laugh at the four white people leading horses out of the town. We stop for lunch in an area called the “Source of White Dragon River”. The view of the mountains from here is amazing, and there is a mountain spring right nearby that we are able to drink directly from(the source of the river I presume). The water is fresh and cold, a stark contrast to the drinking water in Chinese mega-cities like Shanghai. 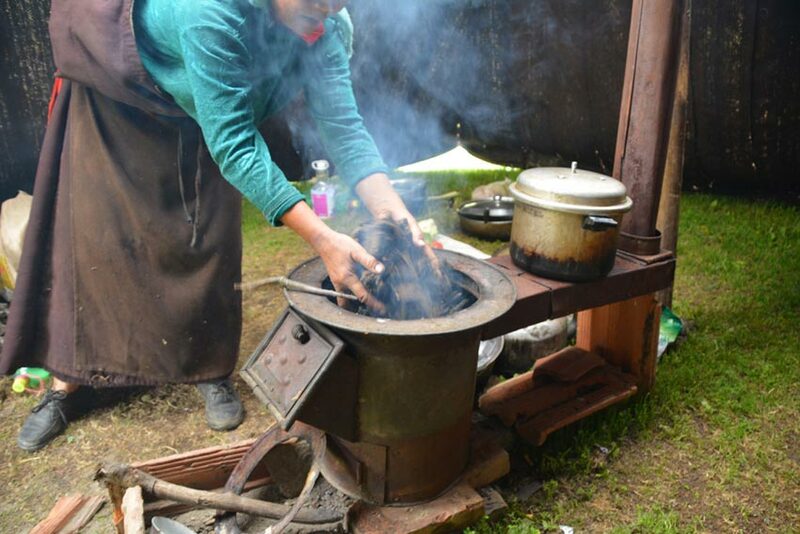 Our lunch is cooked by a local Tibetan woman in her Yak-skin hut. 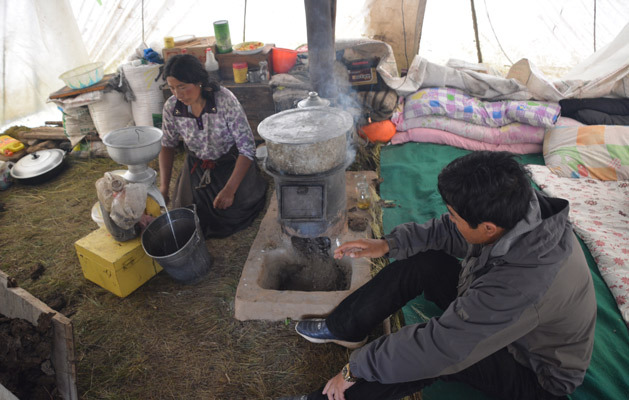 Like all nomad huts in this area, the stove inside uses dried Yak dung as fuel. Although I wish I hadn’t seen her add a big pile of dung to the fire with her bare hands right before grabbing and chopping the tomatoes. 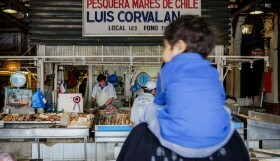 Not sure that would pass a health inspection back in the States. After an hour, we say goodbye to the local woman who cooked for us and her son and get back on the horses. After another three hours on the horses, winding our way up, down, and around the mountains, we arrive in an area known as the Flower Ocean, or Ocean of Flowers. This is where all the nomads live and work most of the year. The grasslands seem to go on forever, and it takes us another hour to make our way to our host’s tent. There are Yak everywhere. I mean everywhere. 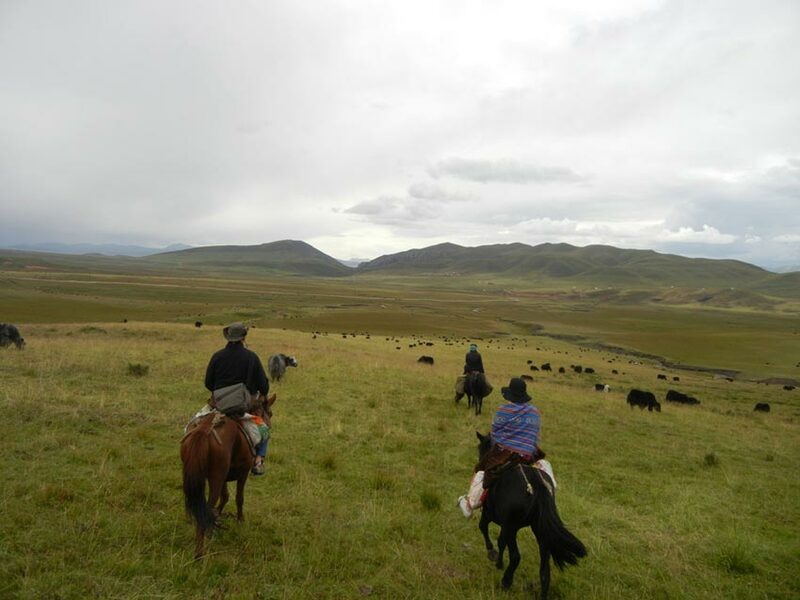 Each piece of grassland in this area is owned by a different family, and each family packs their land with as many yaks, horses, and sheep as they can. It’s so peaceful and beautiful to ride through. It reminds me of when Kevin Costner sees a herd of buffalo for the first time in the movie Dances with Wolves. 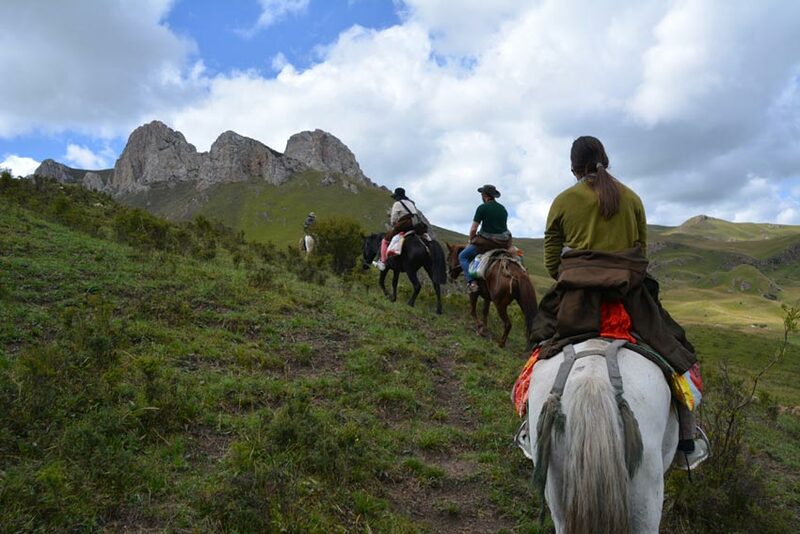 The combination of having to constantly remind my horse it’s not time to eat and the pain in my groin from the uncomfortable saddle has made me more than ready to arrive at our guide’s tent and call it a night. 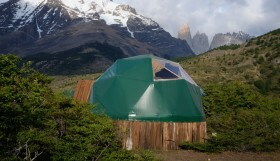 His tent is located on the top of a small hill within the Ocean of Flowers, and it overlooks the land where is livestock spend all day grazing. When we arrive we are greeted by his wife, who only has about 30 seconds to talk to us before having to head back down to the well to fetch more water. 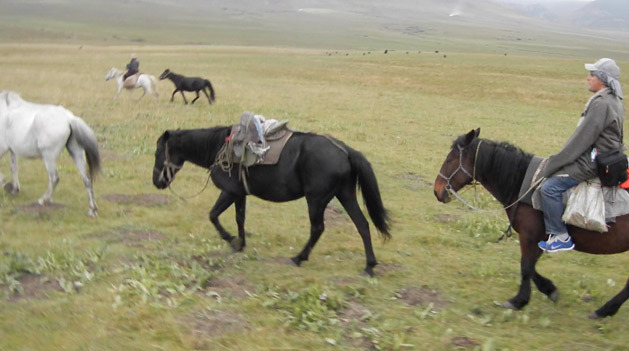 9:00 am: Begin collecting yak dung by hand from the fields as your husband leads the animals out to graze. 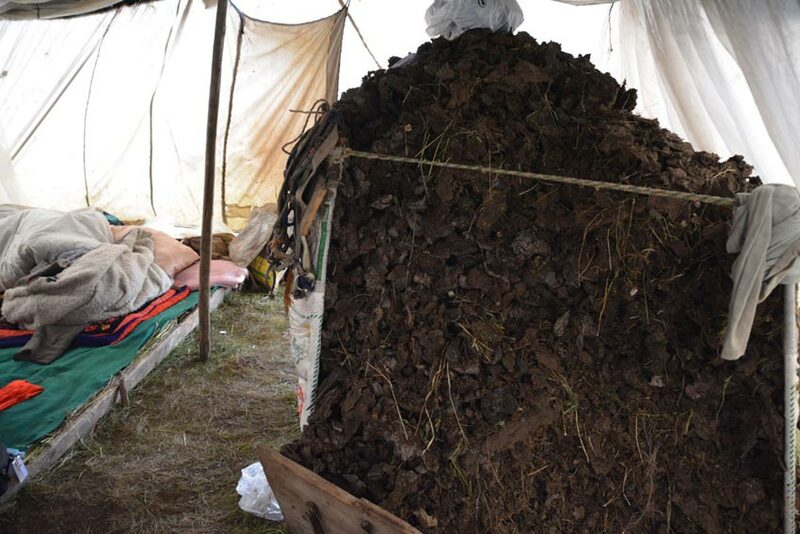 11:00 am: Spread the yak dung out by hand near your tent to dry it out so it can be used as fuel. 7:00 pm: Help your husband bring the yak and sheep herds back to your hill and tie them all up. 8:00 pm: Begin cooking dinner for your husband who is chain smoking and looking at random cellphone pictures. In our case, photos of NBA players. 9:30 pm: Eat whatever food is left over. 10:00 pm: Clean the tent and prepare the beds. 11:00 pm: Goes to bed so you can do it all over again at 4am the next morning. 8:00am: The woman of the house churns butter while the man just sits and smokes. The woman has been up since 4am. The man just woke up. The dinner was fresh noodles (made from scratch), various vegetables in a soup, and dried yak jerky thrown in from some protein. Again, I wish I hadn’t watch her cook it. She grabs a hunk of dung from the pile, throws it into the fire, then begins tearing the noodles into pieces with those same hands. I guess it all gets boiled anyways right? Sanitation concerns aside, the food was actually quite good, although I’m sure it gets old for them really fast, as there doesn’t seem to be a big variety of dinners available to cook up here. It gets pretty cold at night here, and the fire goes out pretty much right after dinner. This leaves us using three or four blankets each to keep us warm. The temperature drops to about 38ºF/3ºC at night and it’s the first time in my life I’ve ever had to bundle up this much to stay warm at night. It’s tough to sleep with the wind constantly blowing on the outside of the tent, and the spiders that keep crawling on me, however eventually we are able to fall asleep. Of course, we awake around 5:00am to see our host’s wife already working away at boiling milk she had just pumped. She let me taste some, and although I prefer cold milk, this yak milk was much better than I expected. 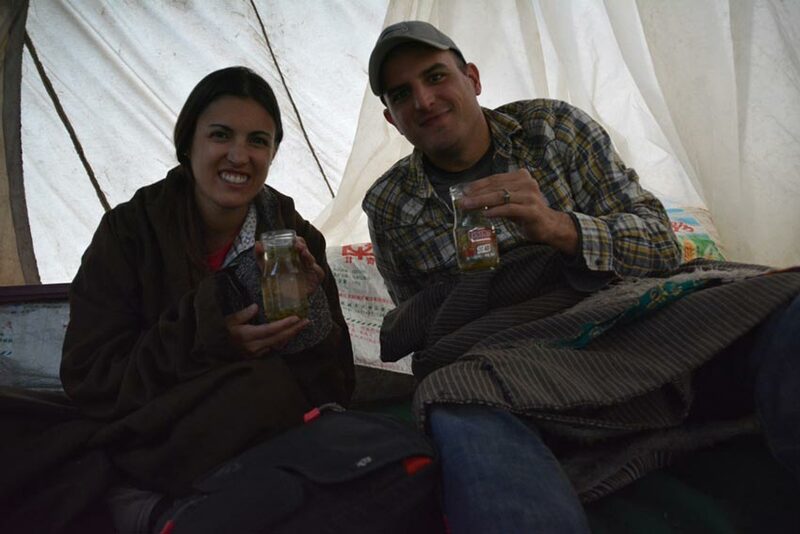 We are also given fresh chinese tea in old tomato sauce jars. 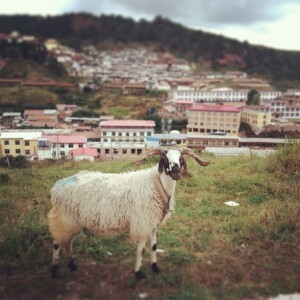 Overall, a nice, authentic Tibetan morning. The ride home is just as scenic as yesterday. Although the riding is a bit different. 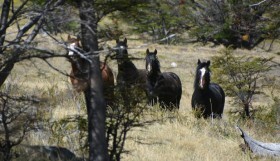 This time, not only do we have the three horses we’re riding, but we have an additional three horses that we are herding back to town. If there is any moment in my life were I legitimately feel like a cowyboy, then this is it. And I’m not talking about that feeling you get a Alan Jackson concert, but the feeling of being a real cowboy. To be honest, it’s actually quite annoying being a cowboy. The horses never listen to me, and I have to constantly ride to the other side of them and make that clicky noise with my mouth to get them to go the direction we want. If we look away for any time at all, they will start eating the grass. After three hours of this, I know for a fact I am not talented enough to be a cowboy, but hey, neither is Tony Romo right? Having done nothing even remotely close to this before, it is hard to describe just how surreal it is to be doing something like it. FOREIGN is the word that comes to my mind the most when trying to describe what it’s like. I had never even been on a horse, and I’ve never slept in a tent that wasn’t inside some sort of campground. I’ve never drank fresh milk like that either, and I grew up in the Dairyland of the United States. Doing so many things foreign to what you’re used to can be very uncomfortable, but it can also be very rewarding. This 36 hour trip is definitely one of our top experiences of the past year, and is something we’ll remember forever. Next time Alissa asks me to get up off the couch and turn the thermostat up, instead of grumbling, I will just do it and be thankful I am not watching her shovel yak dung into a stove. Great photos. Sounds like a cool trip. I always find doing something outside your comfort zone is always rewarding. Even if it is tough or you dont enjoy it at the time I find that when you think about it after it was always worth doing.